Which are the different methods of solving recurrences? Explain with example. Question: Which are the different methods of solving recurrences? Explain with example. There are mainly three ways for solving recurrences. 1) Substitution Method: We make a guess for the solution and then we use mathematical induction to prove the the guess is correct or incorrect. We guess the solution as T(n) = O(nLogn). Now we use induction to prove our guess. We need to prove that T(n) <= cnLogn. We can assume that it is true for values smaller than n.
2) Recurrence Tree Method: In this method, we draw a recurrence tree and calculate the time taken by every level of tree. Finally, we sum the work done at all levels. To draw the recurrence tree, we start from the given recurrence and keep drawing till we find a pattern among levels. The pattern is typically a arithmetic or geometric series. 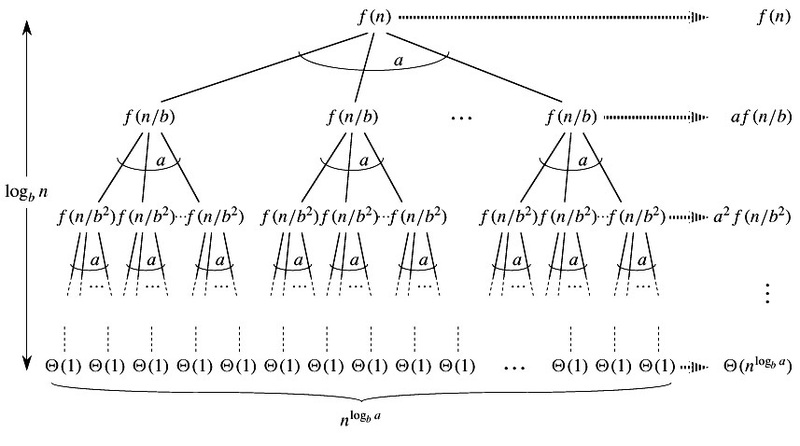 If we further break down the expression T(n/4) and T(n/2), we get following recursion tree. The above series is geometrical progression with ratio 5/16. To get an upper bound, we can sum the infinite series. 3) Master Method: Master Method is a direct way to get the solution. The master method works only for following type of recurrences or for recurrences that can be transformed to following type. In recurrence tree method, we calculate total work done. If the work done at leaves is polynomially more, then leaves are the dominant part, and our result becomes the work done at leaves (Case 1). If work done at leaves and root is asymptotically same, then our result becomes height multiplied by work done at any level (Case 2). If work done at root is asymptotically more, then our result becomes work done at root (Case 3).